A sudden rise in voltage for a very short duration on the power system is known as a Voltage Surge or Transient Voltage. Transients or surges are of temporary nature and exist for a very short duration (a few hundred μs) but they cause over Voltage Surge on the power system. They originate from switching and from other causes but by far the most important transients are those caused by lightning striking a transmission line. When lightning strikes a line, the surge rushes along the line, just as a flood of water rushes along a narrow valley when the retaining wall of a reservoir at its head suddenly gives way. In most of the cases, such surges may cause the line insulators (near the point where lightning has struck) to flash over and may also damage the nearby transformers, generators or other equipment connected to the line if the equipment is not suitably protected. Fig. 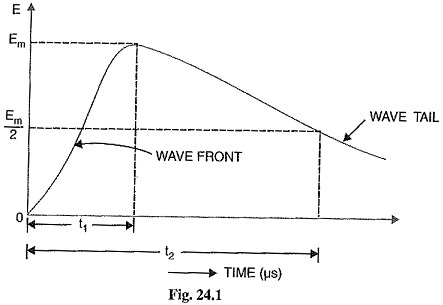 24.1 shows the wave-form of a typical lightning surge. The voltage build-up is taken along y-axis and the time along x-axis. It may be seen that lightning introduces a steep-fronted wave. The steeper the wave front, the more rapid is the build-up of voltage at any point in the network. In most of the cases, this build-up is comparatively rapid, being of the order of 1-5 μs. Voltage Surge are generally specified in terms of rise time t1 and the time t2 to decay to half of the peak value. For example, a 1/50 μs surge is one which reaches its maximum value in 1μs and decays to half of its peak value is 50 μs. The overvoltages on a power system may be broadly divided into two main categories viz. Internal causes do not produce surges of large magnitude. Experience shows that surges due to internal causes hardly increase the system voltage to twice the normal value. Generally, surges due to internal causes are taken care of by providing proper insulation to the equipment in the power system. However, surges due to lightning are very severe and may increase the system voltage to several times the normal value. If the equipment in the power system is not protected against lightning surges, these surges May cause considerable damage. In fact, in a power system, the protective devices provided against over voltages mainly take care of lightning surges. Internal causes of over voltages on the power system are primarily due to oscillations set up by the sudden changes in the circuit conditions. This circuit change may be a normal switching operation such as opening of a circuit breaker, or it may be the fault condition such as grounding of a line conductor. In practice, the normal system insulation is suitably designed to withstand such surges. We shall briefly discuss the internal causes of over voltages. 1. Switching Surges: The overvoltages produced on the power system due to switching operations are known as switching surges. 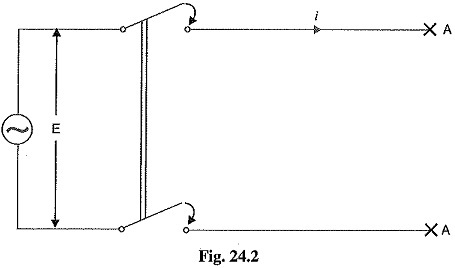 (i) Case of an open line: During switching operations of an unloaded line, travelling waves are set up which produce overvoltages on the line. As an illustration, consider an unloaded line being connected to a voltage source as shown in Fig. 24.2. When the unloaded line is connected to the voltage source, a voltage wave is set up which travels along the line. On reaching the terminal point A, it is reflected back to the supply end without change of sign. This causes voltage doubling i.e. voltage on the line becomes twice the normal value. If Er.m.s. is the supply Voltage Surge, then instantaneous voltage which the line will have to withstand will be 2√2 E This overvoltage is of temporary nature. It is because the line losses attenuate the wave and in a very short time, the line settles down to its normal supply voltage E. Similarly, if an unloaded line is switched of the line will attain a voltage of 2√2 E for a moment before settling down to the normal value. (ii) Case of a loaded line: Overvoltages will also be produced during the switching operations of a loaded line. Suppose a loaded line is suddenly interrupted. This will set up a voltage of 2 Zn i across the break (i.e. switch) where i is the instantaneous value of current at the time of opening of line and Zn is the natural impedance of the line. For example, suppose the line having Zn=1000Ω carries a current of 100 A (r.m.s.) and the break occurs at the moment when current is maximum. The voltage across the breaker (i.e. switch) = 2 √2 x 100 x 1000/1000 = 282.8 kV. If Vm is the peak value of voltage in kV, the maximum voltage to which the line may be subjected is = (Vm + 282.8) kV. (iii) Current chopping: Current chopping results in the production of high voltage transients across the contacts of the air blast circuit breaker. It is briefly discussed Unlike oil circuit breakers, which are independent for the effectiveness on the magnitude of the current being interrupted, air-blast circuit breakers retain the same extinguishing power irrespective of the magnitude of this current. When breaking low currents (e.g. transformer magnetizing current) with air-blast breaker, the powerful de-ionizing effect of air-blast causes the current to fall abruptly to zero well before the natural current zero is reached. This phenomenon is called current chopping and produces high transient voltage across the breaker contacts. Overvoltages due to current chopping are prevented by resistance switching. 2. Insulation failure: The most common case of insulation failure in a power system is the grounding of conductor (i.e. insulation failure between line and earth) which may cause overvoltages in the system. This is illustrated in Fig. 24.3. Suppose a line at potential E is earthed at point X. The earthing of the line causes two, equal voltages of -E to travel along XQ and XP, containing currents -E/Zn and +E/Zn respectively. Both these currents pass through X to earth so that current to earth is 2 E/Zn. 3. Arcing ground: In the early days of transmission, the neutral of three phase lines was not earthed to gain two advantages. Firstly, in case of line-to-ground fault, the line is not put out of Secondly, the zero sequence currents are eliminated, resulting in the decrease of interference with communication lines. Insulated neutrals give no problem with short lines and comparatively low Voltage Surge. However, when the lines are long and operate at high voltages, serious problem called arcing ground is often witnessed. The arcing ground produces severe oscillations of three to four times the normal voltage. The phenomenon of intermittent arc taking place in line-to-ground fault of a 3Φ system with consequent production of transients is known as arcing ground. The transients produced due to arcing ground are cumulative and may cause serious damage to the equipment in the power system by causing breakdown of insulation. Arcing ground can be prevented by earthing the neutral. 4. Resonance: Resonance in an electrical system occurs when inductive reactance of the circuit becomes equal to capacitive reactance. Under resonance, the impedance of the circuit is equal to resistance of the circuit and the pl. is unity. Resonance causes high voltages in the electrical system. In the usual transmission lines, the capacitance is very small so that resonance rarely occurs at the fundamental supply frequency. However, if generator e.m.f. wave is distorted, the trouble of resonance may occur due to 5th or higher harmonics and in case of underground cables too.